Two complementary noninvasive techniques, carotid phonoangiography and oculoplethysmography, were used to evaluate 360 carotid arteries in 208 patients to determine their diagnostic accuracy based on arteriography. A composite diagnostic accuracy of 86% by phonoangiography and 91% by oculoplethysmography was achieved. Intraoperative flow measurements from 69 operative procedures in 66 patients were used to evaluate the ability of arteriography, phonoangiography, and oculoplethysmography to assess the hemodynamic significance of a given carotid occlusive lesion. Arteriography had a composite accuracy of 86% (10% false positives and 4% false negatives). 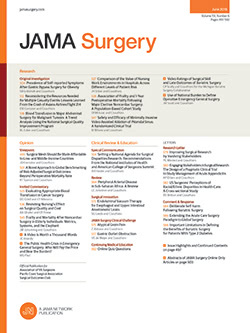 This recognizes the bias introduced by surgical selection being based on arteriography. Phonoangiography gave 72% accurate interpretations (9% false positives and 19% false negatives). Oculoplethysmography was more accurate with 87% correct interpretations (3% false positives and 10% false negatives). No contraindications or significant complications were encountered with these methods.